Georgia sophomore running back Todd Gurley is approaching the 1,000-yard mark despite dealing with injuries this season. This is a matchup of backups. Neither team ended the season with its starting quarterback, and both were shells of their former selves without them. Georgia appears to miss Aaron Murray more than Nebraska misses Tyler Martinez, though, not only because Murray is the SECâs all-time leading passer with a host of other records, but also because Martinez has been out for eight games. During that time, redshirt freshman Tommy Armstrong Jr. and senior Ron Kellogg have led the offense to five wins. Armstrong is a solid runner who manages the read-option with great efficiency, while Kellogg, who started in the Cornhuskerâs final game against Iowa (a 38-17 loss) is a more effective passer. But the Nebraska offense has struggled with consistency. With Martinez, the Cornhuskers averaged 45.8 points per game. Without him, they have averaged only 27.3. Georgia has no real offensive barometer. Murrayâs backup, Hutson Mason, led the Bulldogs to a double-overtime victory against Georgia Tech in his only start, but that win fell largely on the shoulders of running back Todd Gurley. Mason put up good numbers in the second half against Kentucky after Murray went down with a season-ending ACL injury, and he completed 22 of his 36 passes for 299 yards against the Yellow Jackets. But a bowl environment is different. The starter that handles it best will likely come out on top. When these two teams met a year ago in the Capital One Bowl, Georgia tailback Todd Gurley ran for 125 yards and a touchdown as the Bulldogs beat the Cornhuskers, 45-31. 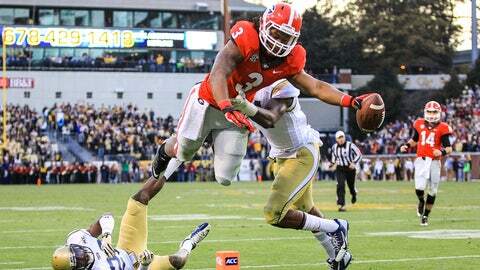 Gurley has put up impressive numbers, rushing for 903 yards and 10 touchdowns in 144 rushing attempts. But those donât approach the 1,385 yards and 17 TDs he had in 2012. A big part of that was injuries — Gurley missed three games and parts of others while being hampered by quadriceps and ankle injuries. This season, Murray accounted for most of the Bulldogsâ offense through the air. But with Murray and Marshall out, expect Gurley to carry the load. 176.1: The Cornhuskers rank eighth in the Big Ten in rushing defense, giving up 161.2 yards per game. Georgia averages 176.1 yards on the ground. Expect Georgia offensive coordinator Mike Bobo to run Gurley off tackle until the Cornhuskers prove they can stop him. If Georgia controls the ground game, it should control the outcome. Neither of these teams is as good as they were a year ago when Georgia was one play away from making it to the BCS Championship and Nebraska played in the Big Ten Championship game. But at 8-4, both have a lot of prove. Can Georgia win without Murray and what will Masonâs performance at quarterback say about the Bulldogs prospects for 2014? Will a decisive and turnover-free performance by Nebraska (the Cornhuskers are -12 in takeaways this season) be enough to quiet the hostile critics in Lincoln? Either way, this game is less about ending 2013 than it is about jumpstarting the 2014 campaign.